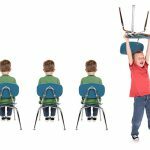 If you ask most people what the symptoms of ADHD are, you are likely to get a lot of input about not being able to sit still, blurting out information, constantly moving, lack of focus and probably impulsive behaviors. You would probably hear this from parents/caregivers, teachers and maybe even those without person experience, based on what they have heard. And this would most likely all be true to some extent for someone diagnosed with ADHD. However, there is an interesting new study that also indicates that those living with ADHD may have tactile response issues. This article appears in a rather unlikely source – Gears of Biz, Technology That is Useful to Your Business and Career – but they are sharing information that appears in the Journal of Neurophysiology, indicating that there is some evidence that those dealing with ADHD have a delay in reaction time and detecting a weak stimulus on the skin. What is interesting to me is that the speculation is that this is “possibly also due to low levels of the neurotransmitters that calm nerve activity”. Though obviously there is more research to do, but it does not take much imagination to speculate that if this is true, that there are ‘low levels’ of a neurotransmitter that calms nerve activity, it could explain a lot of the behaviors that are going on. At least to me that makes sense. Perhaps our highly active child/teen is simply looking for the stimulation that will trigger this nerve calming neurotransmitter. Again, there is more research that needs to be done, but I found this very interesting. One of the things about working with horses is that there is an incredible amount of stimulus. From the visual environment, to the massive tactile input received while grooming, not to mention, auditory and olfactory stimulation, our clients get a big dose of sensory information and perhaps this is part of what helps them actually calm themselves while working with the horses. 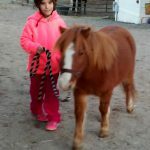 Even those who would normally be overwhelmed by too much stimulation are able to find ways to calm themselves, slowing down, taking deep breaths or just taking a time out, because they really do want to be with the horses. We work with children as young as 4, teens, adults and even seniors. Our work is one-on-one. One client, one Qualified Mental Health Associate (QMHA) and one horse. We work on each client’s specific issues and goals. 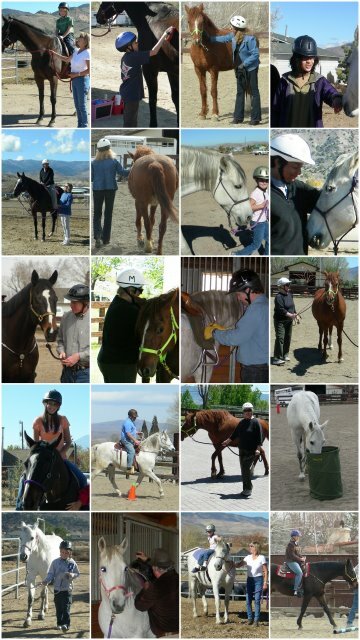 From leading, grooming, learning about horse and herd behavior to actually riding, our clients experience a wide range of new and sometimes challenging situations, that help them find new ways to deal with their life challenges. If you or someone you know are struggling with ADHD (or another social, emotional, behavioral of mental health issue) call or email us to schedule a visit to the ranch. We will show you around, introduce our wonderful horses, learn more about what you are dealing with and share how we may be able to help. This entry was posted in ADHD, Children's issues, In my opinion, Mental Health, Sensory processing issues, Teens. Bookmark the permalink.